Everyone knows that Nicholas II was executed along with his entire family in 1918, almost a year after the Bolsheviks seized power. But long before his reign, regicide was not uncommon. Ivan VI (Ivan Antonovich, 1740 - 1764) never chose his destiny. He was just a two-month old baby when proclaimed emperor, succeeding Empress Anna Ioannovna in 1740. It was the peak of the so-called “age of palace coups” of the 18th century when emperors and empresses changed rather quickly, supported by influential puppet masters from the aristocracy. The group that supported Ivan lost after two months of the toddler’s “rule,” and he was imprisoned. Ivan remained behind bars his whole childhood, living in remote castles and scarcely communicating with anyone. Ivan’s miserable life didn’t last long, and in 1764 a military officer planning another coup tried to free him. The prison guards, following their instructions, stabbed the former child emperor to death. Perhaps he was the most innocent victim of brutal 18th century power struggles. Widely unpopular both among the aristocracy and the masses, the German-born Emperor Peter III (1728 – 1762) ruled Russia only for six months. The royal guard, anxious about Peter’s wish to send them to fight against Denmark, overthrew the emperor and gave the throne to his wife, Catherine II (Catherine the Great). The arrested emperor was held in a palace in Ropsha outside of St. Petersburg, and after a week he was reported dead. It is still unclear what happened, but according to the official version he died of a hemorrhoid colic attack, but this is doubtful. A letter from Alexey Orlov, Catherine’s favorite responsible for Peter’s imprisonment said that he was killed accidentally during a fight caused by his tantrum. There is also a suspicion shared by some that Catherine secretly ordered the execution of her husband. Catherine’s son and successor, Paul I (1754 - 1801), hated his mother and was fond of his father, Peter III. He was a strict and rigorous ruler who tried to turn the clock back on many of Catherine’s reforms that strengthened the aristocracy, and this led to a serious conflict. The nobles responded by plotting a coup, and most historians believe that even Paul’s son, Alexander, secretly supported the coup. At the beginning of his reign Paul was naturally suspicious of potential enemies, so he built a castle in the center of St. Petersburg (St. Michael’s castle), which he believed would be safe and impregnable, so he spent almost all of his time there. That castle turned out to be a trap, however, and on March 12, 1801 the conspirators - noble officers from his palace guard led by Peter von der Palen, the governor of St. Petersburg - broke into Paul’s room. They brutally beat him and finally choked him with a scarf. The next morning, his son was crowned Alexander I. As for poor Paul, his ghost is believed to still haunt St. Michael’s castle. No other emperor ever lived in it after his death. In 1861, Alexander II (1818 - 1881) launched probably the most long-awaited reform in the 19th century – the abolishment of serfdom that gave freedom to millions of peasants. Freedom, nevertheless, was not palpable because peasants had to keep working for their lords for decades in order to claim ownership of the land. This “deception” provoked public outrage that, combined with Alexander’s rather liberal approach towards society, led to revolutionaries hunting the emperor with guns and bombs. Alexander survived several assassination attempts - activists from Narodnaya volya (“People’s Will”) blew up a room in the Winter Palace where he was supposed to be - and another time a revolutionary tried to shoot him but missed. Finally, the assassins succeeded on March 1, 1881 when a bomb exploded near the emperor’s carriage, wounding several Cossack guards. 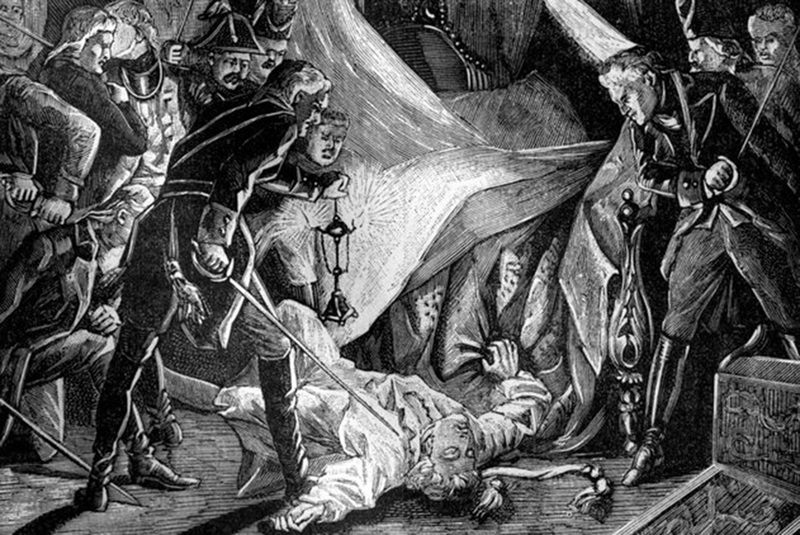 Alexander, fearing nothing, came out to inspect the wounded - and that was when Polish revolutionary Ignacy Hryniewiecki threw a second bomb, killing both himself and the emperor. One can easily find the place where Alexander II was assassinated - his son and successor Alexander III built a church on the site where the royal blood was spilled, and it’s called the Church of the Savior on Spilled Blood (or just Savior-on-the Blood) and remains one of the most spectacular buildings in the center of St. Petersburg.